Angela Merkel in a Hitler uniform, Wolfgang Schäuble as Gollum, Aphrodite giving the one-fingered salute, the Greeks all swindlers, the Italians idle loafers – to judge from media output over the past two or three years, there’s not much left of European unity and good neighbourliness. Discussions have instead focused on ‘fascism’, on the ‘subjugation of foreign peoples’, even on ‘war’. How are the media influencing political and social debate in Europe and thus also the current bad mood between some European countries? That is the object of this year‘s M100 Young European Journalists Workshop (formerly the M100 Youth Media Workshop) that invites young journalists from Europe (including non-EU countries) from 1 to 6 September 2013 to Potsdam. The six-day workshop will discuss how the media in different countries is reporting on Europe, the positions it takes, does it really reflect the mood of the population and how different branches of the media in several countries report on the same topic, amongst others. The workshop will be held in English. The workshop is guided by multi award-winning journalist, filmmaker and coach Christian Stahl, and takes place in cooperation with the Axel Springer Academy. In addition to an intensive debate and camera training, they will research facts, produce videos, texts and blogs, finishing with 20 cross-media theses about Europe. On 5 September, the participants in the M100 Young European Journalists Workshop will take part in the M100 Sanssouci Colloquium. Under the topic “Are the Media destroying Europe?” six top journalists from different European countries will examine issues of the media’s influence on the European integration process and neighbourly relations, of who takes what positions and why, and of what role types of political communication play in this context. The debate will be moderated by well-known British BBC presenter Tim Sebastian, originator of the BBC‘s legendary ‘Hardtalk’ interview series and host of ‘The New Arab Debates’ for Deutsche Welle TV. The M100 Young European Journalist is an initiative of the City of Potsdam and Potsdam Media International e.V. and takes place as part of M100 Sanssouci Colloquium. This year’s M100 is supported by the City of Potsdam, Medienboard Berlin-Brandenburg, Federal Foreign Office, Bundeszentrale für politische Bildung, and the ZEIT Foundation; cooperation partners include the Axel Springer Academy, Deutsche Welle, European Council on Foreign Relations, European Youth Press, Human Rights Watch, Intajour – International Academy of Journalism, Land Brandenburg, Prussian Palaces and Gardens Foundation Berlin-Brandenburg, and Reporters without Borders. The organisers of the M100 Young European Journalists Workshop will COVER ACCOMMODATION AND BOARD during the workshop. A TRAVEL ALLOWANCE is provided. Candidates may apply by submitting a short text in English and the following task: “New Media – New Europe?” Describe in a maximum of 500 words how the media can contribute to overcoming Europe’s public crisis. Please include concrete references to the media situation in your home country. Please include a brief CV (with a photo) and motivational statement in your application, stating your reasons for applying for this particular workshop (both in English). Please send your application in by 1 July 2013 to Ms Sabine Sasse, s.sasse@m100potsdam.org. 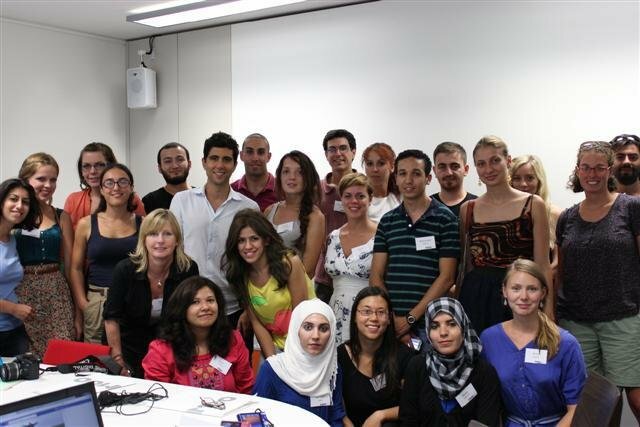 20 participants will be selected from among the applicants and invited to Potsdam from 31 August (arrival) to 7 September 2013 (departure). For more information, please see the official website HERE.